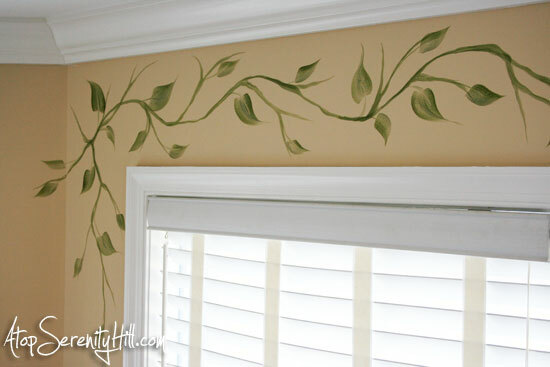 A couple of weeks ago, I handpainted a floral vine for a client as an alternative to having valances made for her breakfast nook. She did not want the view and light from the windows to be obscured or to create a heavy feel in the room with the addition of fabric. 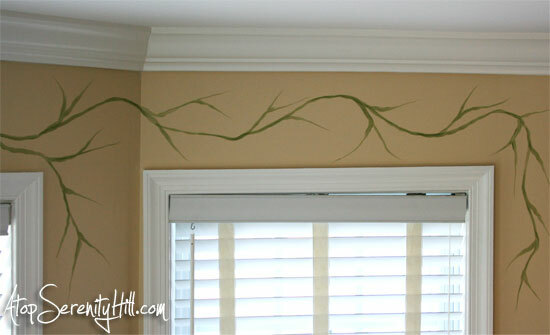 Adding a custom painted vine draping over her windows gave the room a unique feel and added a light, pretty addition to the walls. I started by painting a soft branchy, vine with FolkArt Olive Green and Italian Sage. The great part about handpainting borders is that I can fit them into any space. That is not so easy with wallpaper border. I then added medium and large size leaves using the same color combination. 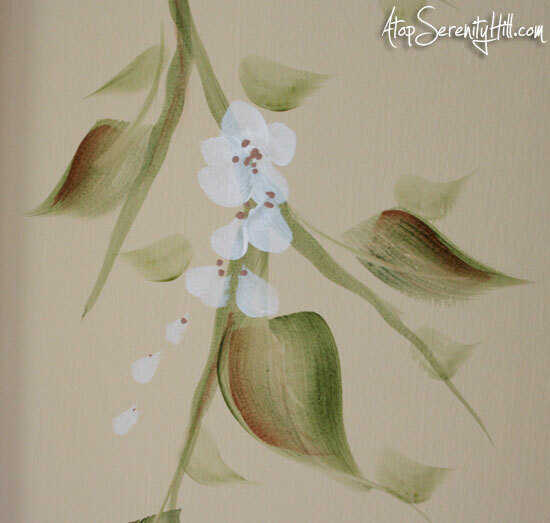 To fill out the vine, I painted in small white flowers with trailing petals and tiny filler leaves. To tie in the brown of the wood furniture in the eating area, I added touches of Maple Syrup to each of the larger leaves and on the vine. It brought a warmth to the design that I just loved. If you love borders but find that the space you want to add the border to is a weird shape or is broken up by doors or windows, having a custom handpainted design created for the space is a great alternative. 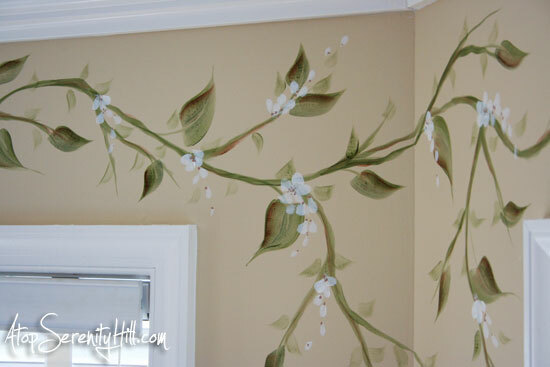 If you have painting experience, this design is fairly simple to accomplish. I always told my painting students to just go for it!! After all, it is just paint…if you don’t like it, paint over it!! Have you ever painted a border yourself? Have you had a border painted for you? I would love to hear your comments! Thanks, Tonniece! I loved doing the project and the client was happy with the results! Thanks! I totally enjoy painting on walls. It can add so much to a room. Thanks for visiting, “Ms Lemon”! Hi Cher, thanks! After seeing your woodworking, I say if you build it, I’ll paint it!!! Lol! Have a great week..
What a beautiful valance border you have created. I’m sure the homeowner is going to enjoy it for years to come. Thanks! She was super pleased with the results! Great job, love all the details. What a unique touch. Thanks for sharing. Thanks, Christa. The client definitely appreciated the unique aspect! Thanks, Virginia! I loved your domino charms! How LOVELY!!!! It looks absolutely beautiful, so sweet and charming! I’ve done a couple of murals too, they are so much fun to do and really add personality to a room! Love what you did!!! Thanks, Maria! I wish I had more murals to work on! Hopefully this year I will have more opportunities. 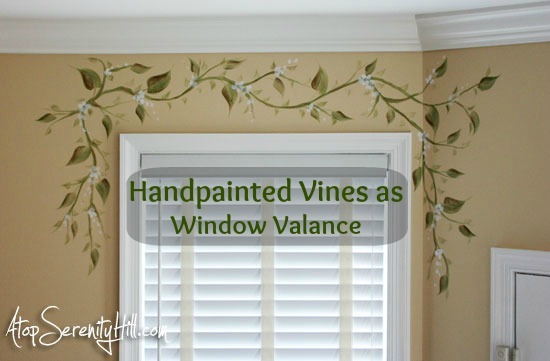 I am looking to paint an actual valance above my window , but I am looking for a stencil or pattern……any ideas? Hi Annette, I would try Royal Stencils. http://www.royaldesignstudio.com/ They have a ton of large stencils that might work for your project. Good luck with it!